This beautifully executed Starburst is a rare find. 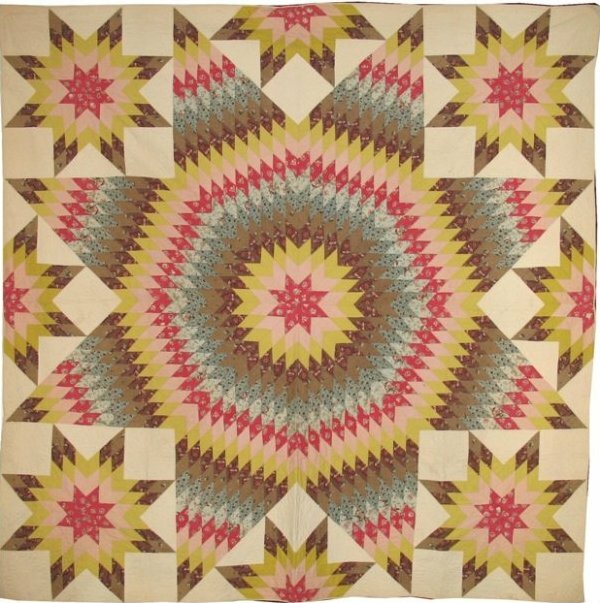 The pre-1850s printed chintzes are skillfully arranged as concentric ombre'd circles of color -- teal| camel| aqua| rose| peach| chartreuse and brown. The areas between the star arms are filled with full or half stars. A treat for a fabric lover| a star collector or someone who covets a classic early impressive quilt. The quilting is about twelve stitches per inch in wreaths and flower and leaf forms in all the ivory areas; outline quilting around all the diamond shapes. Binding which is a narrow ecru cotton| folded and applied to the edge. Condition is untouched| as found| with age patina| perhaps washed once long ago. Some popping visible in some rose colored diamonds(photo).